No matter you want to transfer music from iPhone to iPad, or transfer songs from iPad to iPhone, in this guide you will get a quick & easy way to make it. Free download AnyTrans on your computer firstly, and then follow us to transfer music from iPhone to iPad, or transfer songs from iPad to iPhone. Just like the questions mentioned above, many people are facing the same problem – can’t get a way to transfer music from iPhone to iPad or from iPad to iPhone. If you are also stuck on this problem, congratulations, this post is what you are looking for. In this guide we will offer you a way to share music between iPhone and iPad, no matter you want to transfer music from iPad to iPhone, or transfer songs from iPhone to iPad, you can make it with a few clicks. When it comes to transferring music from iPad to iPhone, or from iPhone to iPad, normally, the first solution we thought is iTunes syncing. However, iTunes just allows you to sync music from computer or iTunes library to iPhone or iPad, and transferring music from iDevice to back to iTunes or computer is not supported, let alone transferring music from one iDevice to another. To help you share music between iPhone and iPhone with ease, in this guide we will recommend you a fantastic iPhone to iPad/iPad to iPhone transfer tool – AnyTrans, which allows you to transfer music, playlists, ratings, and plays from one iDevice to another directly without iTunes. Before starting the tutorial about how to transfer music from iPad to iPhone or from iPhone to iPad with AnyTrans, let’s make a brief introduction about the tool we’ll use. Supports syncing music from computer or iTunes library to iPhone iPad without easing any existing data on device. Supports transferring music from iPhone iPad back to computer or iTunes library. This is not supported by iTunes. During syncing, playlists, rating, plays also will be transferred as well as songs. Supports transferring music and songs between two iDevices directly. 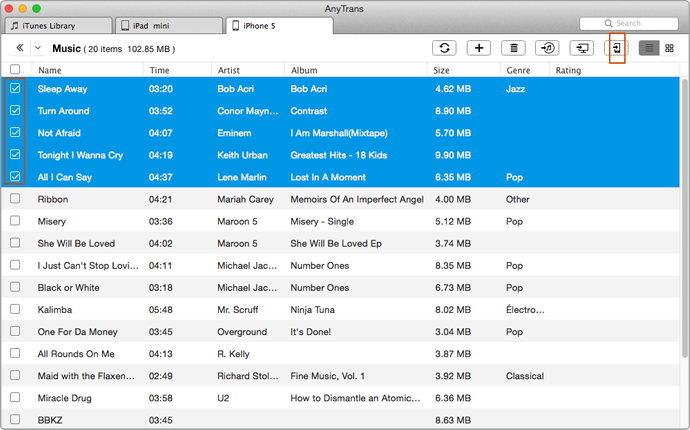 No matter you want to get music from iPhone to iPad, or from iPad to iPhone, AnyTrans helps you make it. Compatible with all the models of iPhone and iPad, including iPhone 4/4s/5/5s/6/6s/SE, and iPad 1/2, iPad Air, iPad Pro, etc. No matter you want to transfer music from iPhone to new iPad, or get songs from iPad to newly bought iPhone, you can follow the tutorial below to make it. Let’s move on! Step 1: Free download AnyTrans on your computer (PC or Mac), install & run it. And then connect both of your iDevices to computer with its USB cable. Step 2: On homepage of AnyTrans, select Audio > click Music. Step 3: Select the songs you want to transfer > Click To iDevice to transfer selected songs to target iPhone or iPad. This tutorial is also can be applied to transfer music from iPhone to iPod, or iPad to iPod, even iPhone to iPhone and iPad to iPad. Anyway, you want to transfer music from one iDevice to another, you can follow this guide to make it. 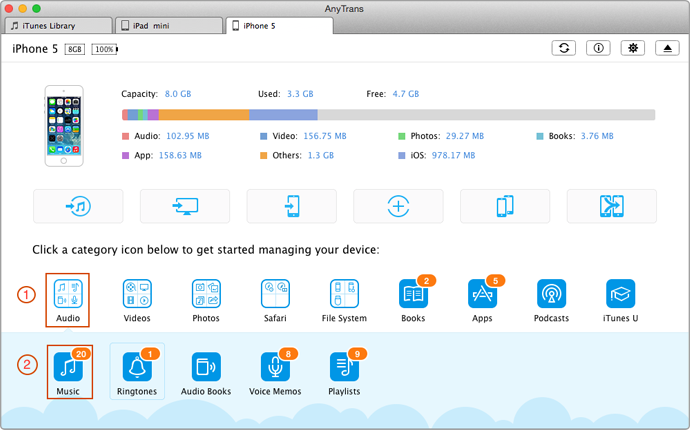 With AnyTrans, you also can delete multiple or all songs from iPhone iPad at once.